Written by Simon Furman, art and covers by Alex Milne. Written by Simon Furman, Stuart Moore and Nick Roche, art by Don Figueroa, Guido Guidi, Marcelo Matere, Robby Musso and Nick Roche. Written by Simon Furman, art by E.J. Su, covers by Su and Nick Roche. The end is nigh ... and how! Shocks and revelations abound as the latest chapter of the new IDW Transformers saga draws to its conclusion. Earth's fate hangs in the balance, as the Reapers and Decepticons clash for the right to scribe its final hours, while a new and perhaps far deadlier foe orchestrates his own apocalyptic power play. Where are the Autobots in Earth's darkest hour? The answer will leave readers reeling. Written by Simon Furman and Ben Yee, art by Don Figueroa, Marcelo Matere, Robby Musso and Nick Roche, cover by Figueroa. Furman and Yee conclude their all-encompassing, unifying resource book highlighting the characters, worlds and technology from all generations and incarnations of Beast Wars with the fourth volume of this informative collection. From Silverbolt to Waspinator, and featuring new art from a host of the greatest Transformers artists, this is the series that explains everything you need to know about the world of the Beast Wars! Written by Simon Furman, art by Don Figueroa and Guido Guidi, cover by Figueroa. Spiraling out of the events in Beast Wars: The Gathering. Magmatron, now a disembodied entity, existing out of time and space, is witness to Cyberton's unchecked descent into chaos and madness, all of which is a prelude to its complete and utter destruction! Powerless to directly affect this terrifying apocalypse, Magmatron's last desperate recourse is to try and bring his greatest enemy, Razorbest, together with fellow Maximals Lio Convoy and The Pack! Written and art by Harold Gray. 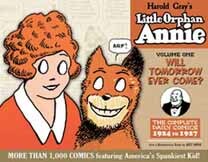 The Complete Little Orphan Annie is the second series to be released under IDW's The Library of American Comics imprint, edited and designed by Dean Mullaney. Volume One will contain more than 1,000 daily comics in nine complete stories, from the very first strip in August 1924 through October 1927. In the pages of �Will Tomorrow Ever Come?� readers will discover how Annie escapes the orphanage and is ultimately adopted by �Daddy;� how she finds that loveable mutt Sandy and rescues him from being tortured; how she meets the Silos, who become recurring characters throughout the series; how she joins the circus and first encounters Pee Wee the elephant; and how, broke and alone, she hits the road on a succession of dangerous yet spiritually uplifting adventures. This volume also includes an index, and a biographical essay by Jeet Heer. Written by Barbara Kesel, art by Renae De Liz, cover by Rebecca A. Wagner. Gold Eagle's novel heroine comes to comics for the first time! Annja Creed is a world-traveling archeologist who also happens to be the heir to Joan of Arc's mystic sword. In this debut miniseries, Annja's drive to explore unrecorded, shadowy history leads her to Virginia City in search of a rumored manuscript that could change the public perception of Mark Twain forever. But a very powerful mystery man doesn't want anyone to find the truth, and will stop at nothing -- not even murder�to keep Annja away from the answers she seeks. Written by Tom Waltz, art and cover by Steph Stamb. IDW Publishing returns to the darkest corners of Konami's Silent Hill franchise in this new series. When hitman Jack �The Pup� Stanton runs away with his mob boss's wife, he thinks he's finally put his murderous past behind him. Instead, Jack and his lover take a wrong turn into Silent Hill and quickly learn that some sins are impossible to escape. Written by Joss Whedon and Brian Lynch, art by Franco Urru, covers by Andrew Robinson and Urru. As the first chapter in this epic tale reaches its penultimate point, Angel issues a challenge to someone�a lot of someones, actually�that he can't possibly win. Meanwhile, Spike considers changing sides as this hellish new status quo presents some opportunities he can't pass up. And IDW promises a shock ending more explosive than even those of the first three issues. Written by Gary Russell, art and cover by Nick Roche. Written by Pat Mills and John Wagner, art by Dave Gibbons, cover by Joe Corroney. IDW Publishing continues its re-presentation of classic Doctor Who comics from across time and space, each one featuring all-new coloring. In issue three, "The Iron Legion" concludes, and then the good Doctor enters "The City of the Damned." Written by Arie Kaplan, art by Robby Musso, covers by Musso, and Rob Sharp and Joe Sharp. Arie Kaplan and Robby Musso continue to tell the story of past Racers throughout history. In medieval England, inexperienced teenager Sprint Rackham must outrace a madman who's kidnapped Lady Beatrix via his giant mechanical dragon. Even with a suit of armor designed by a wizard, can Sprint rescue her in time? Meanwhile in the present, Speed, Racer X, and Trixie find themselves one step closer to the mystery carjacker, as they come under attack in a super-garage beneath Mercury Pictures! 2 regular covers will be shipped in a 1-to-1 ratio. Written by Lew Strazewski, art by Gary Washington, cover by Ken Steacy. It begins again here! The classic Now Comics Speed Racer series from twenty years ago gets the full deluxe reprint treatment from IDW, including reproductions of Ken Steacy's painted covers, too. In Volume One, collecting the first five issues of the series, Speed faces the "Death of a Racer," goes up against Racer X, and much more! In Volume Two of the classic Now Comics series, Speed faces a "Hollywood Challenge," meets "The Captain of Atlantis," sees Speed off to Japan for an extended adventure, and much more. This volume collects issues 6-13 of the series. Written and art by John Byrne, covers by Byrne and Zach Howard. Legendary writer/artist John Byrne, in his first-ever full Star Trek work, concludes this special series of one-shots in which the many alien races of the Star Trek universe get their due. The Romulan Empire has a new "ghost ship" that can't be detected by normal means. Will the Praetor use it as a weapon to thrust his people into full-blown war with the Federation�or are his motives even more sinister? A tale of loyalty, betrayal and intrigue. Written by Scott Tipton and David Tipton, art by David Messina, covers by Messina and Joe Corroney. The all-new adventure of the Enterprise-D crew continues, with a spotlight on Commander Worf! Worf finds himself in the unfamiliar role of diplomat when he's forced to settle a dispute between Rigelian colonists on a border world, with the fate of the colony hanging in the balance. Can Worf struggle against his own aggressive instincts, or will he do his negotiating with the point of a blade? From the creative team who brought you Klingons: Blood Will Tell, Scott & David Tipton and David Messina. 2 regular covers will be shipped in a 1-to-1 ratio. Written by Mike Baron, art by Kevin Caron, cover by Neil Hansen. In the third chapter of Mike Baron's all-new Badger miniseries, "The Mercy Tax," where once Ham's castle stood is a smoking ruin. Daisy clings desperately to life, her self-confidence destroyed. And in the African veldt, Badger has a confrontation with his totem that changes everything forever. Everything you thought you knew about the Badger was wrong! Plus, Pavlov's plot reaches fruition with the appearance of the greatest martial artist of all time, and no, it's not Count Dante. Written by Peter David, art by J.K. Woodward, Joe Corroney, Dennis Calero and Billy Tucci. Fallen Angel recently learned the secrets of her origin, but little good it will do her as she encounters an all-new series of challenges and mysteries -- both in and outside of Bete Noire. This forth collection features the crossover between Fallen Angel and Tucci's Shi in a three-part tale transporting the Fallen Angel to the far-off City of the Dead, a spotlight on Jude, and more. Collects issues #17-21 of the IDW series. "Red Horse Riding, Part 2." As war continues to ravage Bete Noire, and with Jude the Magistrate taken captive, the Fallen Angel races the clock to try and find her missing son before the power of Bete Noire is usurped. Written by Steve Niles, art and cover by Bill Sienkiewicz. After years of attacks, and several without, the citizens of Barrow have become united against random attacks on their city by the undead. Unfortunately the same does not apply outside of Barrow or the rest of the mysterious Arctic Circle. Niles and Sienkiewicz take the 30 Days of Night mythos and turn it on its head in a terrifying new graphic novel. 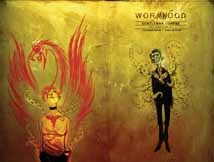 Written an art by Ben Templesmith. Written by Beau Smith, art by Steve Bryant. Jack Bauer is back, and this time, he's far away from his comfort zone in this new one-shot. It had to be something big to draw not only Jack Bauer out of Los Angeles, but Chloe O'Brian as well. Jack and Chloe find themselves at a remote communications station in Alaska during a huge snow storm, trying to stop a Russian terrorist from Jack's past from bringing down all wireless communications in the U.S. Once there, Jack is teamed up with his Alaskan CTU counterpart who also holds a link to Jack's past. Written and art by Ashley Wood. Spectrum-Award winning artist Ashley Wood is a proven favorite, and this deluxe new printing of his Grande Finale�a collection of the popular�and currently unavailable�art books Uno Fanta, Dos Fanta and Tres Fanta�is presented in a special 8.5" x 11" format and contains over 300 pages of outstanding paintings and line art from Wood. Art and cover by Rick Berry. The Sparrow hardcover art book series continues with this mini-showcase of celebrated painter Rick Berry's stylistic offerings. 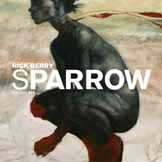 Berry, credited with producing the first digitally painted book cover in the world (William Gibson's Neuromancer) has provided acclaimed images for feature film and deluxe Stephen King book editions, and takes his place alongside Ashley Wood, Phil Hale, Kent Williams, and the other artists whose books comprise the Sparrow series. Written by Gene Simmons, Nick Simmons, Erik Burnham, Frank Fradella, Mark Kidwell, Dwight MacPherson, and Tom Waltz, art by Erik Burnham, Micah Farritor, Mark Kidwell, Ricardo Sanchez and German Torres, cover by Casey Maloney. It's a new year filled with new scares at Gene Simmons House of Horrors. Master of the macabre, Gene Simmons, returns to host five original tales of tantalizing terror. Joining Gene for this shocking issue are writers Erik Burnham, Frank Fradella, Mark Kidwell, Dwight MacPherson, and Tom Waltz, along with artists Micah Farritor, Ricardo Sanchez, and German Torres. Throw in a fantastically creepy cover by Casey Maloney and a bizarrely twisted prose tale from demon spawn Nick Simmons, and you've got all the makings of fright comics at their finest. Written by Tom Waltz, art and cover by Casey Maloney. Gene Simmons' stranger in a strange land tale continues, as Denizen Xeng Ral and his rag tag group of allies continue their dangerous flight from the mysterious Celestial Defense Ministry and the Etherian Hunters, who are seeking to capture Xeng at all costs. By the acclaimed creative team of Children of the Grave, Tom Waltz, with art by Casey Maloney. Written by Clifford Meth, art by Rufus Dayglo, cover by Ashley Wood. Puberty is rough. But it's even harder when you're shedding your skin. And the fangs don't make it any easier. Continuing the saga of Snaked, by Clifford Meth, Rufus Dayglo, and cover artist Ashley Wood. Written by Dara Naraghi, art by Erich Owens, cover by Ashley Wood. IDW Publishing continues to bring the stories of science-fiction author Cory Doctorow to comics, this time offering up a take on Doctorow's "I, Robot," courtesy of Dara Naraghi (Cory Doctorow's Craphound) and artist Erich Owens. With a cover by acclaimed artist Ashley Wood (Zombies vs. Robots).